Hello farm friends, neighbors, and acquaintances. Co-farmer Stefan here. Happy New Year! Happy 2017. I do hope this new year has begun with peace and gratitude in each of your lives. 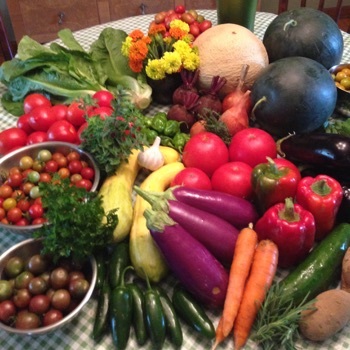 I’m writing today to offer a Farmer’s Perspective looking back at last year’s growing season. 2016 was our fourth year, and we think it was a pretty good one. We set a whole bunch of new harvest records in 2016, and I want to tell you a little bit about that. I also want to reflect a little bit about the weather …. ‘cuz this wouldn’t be a proper Farmer’s Perspective essay without some thoughts about the weather… Plus, I want to report back about the relative success of some of our innovations last year: the new tractor, brussels sprouts, sunchokes, etc. And finally, I wish to thank several folks who worked along with us this year and made the season the success that it was. Veggies first! Like every year, we grew a ton of veggies this year — actually, 25 literal tons. 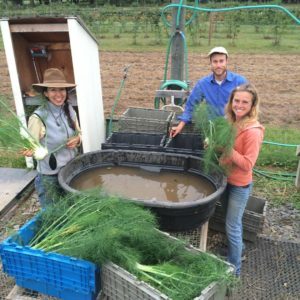 We harvested just over 50,000 lbs this year, which if you average that across our 24 week harvest season, is just over a ton per week. Sounds impressive when you put it that way. 🙂 And 2016 was a year of several new harvest records! This year is the first year that I’ve rigorously scanned through our harvest data to highlight which year posted the highest yield of each crop. And get this: In this year’s harvest sheet, we tracked 48 different crops. Of those 48 crops, we set a new total yield record for 25 different crops this year! I’ll spare you the complete list, but some of the standouts for me were: peppers, tomatoes, eggplant, carrots, beets, kale, broccoli, and spinach. Those are all pretty popular crops, and I think the fact that we set new records for so many of the well-loved staples contributed to an overall good impression of the shares this year. Also, from your Farmer’s Perspective, there were a few crops this year that felt like we finally “figured them out,” meaning that we finally refined our approach to those crops enough to feel like they were working the way we wanted them to work. Beets were one of those. I think we’ve finally settled on a reliable seeder setting for those and figured out a good weeding plan and a good harvest norm. It’s great to feel like we can rely on each beet bed to produce a solid yield. The interplay between kale and collards was another on-farm relationship that made real strides this year. We grew more than twice as much kale this year as in 2015, and I’m glad we did. Not only was it great to have unlimited kale in the shares for much of the season, it also helped us learn some things about our harvest rhythm for kale and how we might adjust the kale and collards for the coming year. So the weather was hot. We noticed that. And Pennsylvania wasn’t alone — nationwide, 2016 was the 2nd hottest year on record. 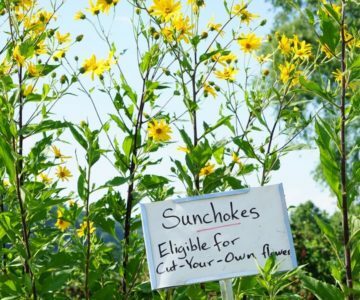 But what does climate change mean for Tinicum CSA? One part of that answer is easy: It looks like it will mean hotter summers, and that means tougher workdays for our bodies. On the other hand, warmer temperatures and more carbon in the atmosphere do, overall, mean an increased potential for plant growth. Amid the other yield records this season, it makes sense that we had a bumper crop of the most sun-loving and heat-loving crops: the tomatoes, peppers, and eggplant. They thought the weather was great! Probably a bigger component of climate change, though, is that it means less predictability. As heat energy is added to the atmosphere, storms will become more dynamic and weather patterns will change faster and become more extreme. We’ve been lucky so far in that the farm hasn’t been smashed with any truly destructive weather in our brief four-year tenure here. In recent years, other parts of the country have faced devastating droughts, flooding, and storms. On the whole, we’ve been very fortunate. We do know, however, that certain seasonal benchmarks — like the date of the last spring frost or the first autumn freeze — are getting tougher to predict. This is a tricky part for us, because those seasonal changes from winter into spring and autumn into winter absolutely affect the timing of our plantings. In the long run, our growing season might get longer, but one is hesitant to risk a whole crop by pushing that envelope. Less predictability also means more erratic rainfall. From a Farmer’s Perspective, a perfect world is one in which it rains about every three days — and always overnight. And usually between half an inch and an inch of rain at a time. This past season, though, we had three periods of problematic drought. As rainfall becomes less predictable, irrigation becomes all the more essential. Knowing that, we plan to be digging in a more permanent set of irrigation pipes this spring. The new system should be less work to use, and that will help us lower the drought-stress levels for both the plants and the growers. One more note on climate change and unpredictability: Climate change also means more intense surges in pest populations. Most insects (and fungi) are highly sensitive to temperature shifts, and as climate change intensifies, we can expect to see more dramatic swings in the populations of both beneficial and destructive insects. 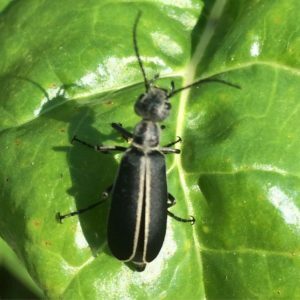 This year, for example, we saw an unprecedented population of these margined blister beetles. And although they did chew up the leaves of several of our crops, they didn’t do enough damage to significantly impact our yields. But enough about that. What about our new experiments and innovations for 2016? This year was our first season trying out the new New Holland tractor, and we loved it! Just as we expected, it made the melon and winter squash harvests much easier, faster, and more pleasant. The New Holland also gave the ol’ International Harvester 404 a chance to take the entire season off for a thorough engine rebuild. Up ‘til this year, the 404 had been our go-to machine for rototilling, furrow-busting, and mowing, so it was getting a lot of wear. The 404 just recently returned from the shop, and we look forward to enjoying its new robustness in the coming season. This was also our first season trying out brussels sprouts. From your Farmers’ Perspective, our first harvest of the brussels sprouts fell on a cold, rainy, windy morning in late October. We had our rain gear on, kneeling in the cold mud. The cold wind blew the cold rain in our cold faces, and our cold, stiff fingers tried to polish up these clumsy foreign stalks. On top of the sub-par weather that morning, it was our first attempt at this harvest, and we hadn’t refined our harvest technique at all. This matters. Plus, that first variety of brussels sprouts really didn’t look too good. The plants had grown vigorously, but the outer leaves on many of the sprouts were yellowed or plainly chewed up by flea beetles. The whole experience was demoralizing, and we were ready to cross brussels sprouts off the crop plan for next year. We put that first harvest of sprouts up on the Sharing Table and didn’t even weigh it for our harvest records. Then a couple weeks went by, and we decided to harvest the second variety of brussels sprouts for the Bonus Share. This time, we came up with a faster technique that put less strain on our wrists. (It turns out all those leaf-stems snap right off if you swat them with your hand; no need for knives.) Also, the sprouts themselves looked better this time. This other variety had matured more slowly, but the sprouts were in better shape. And the weather was better that day. The whole process went much more smoothly, and we felt good about including the brussels sprouts in the bonus share. And — as is a common enough occurrence with vegetable crops — they won me over during the eating stage. I hung onto some of our brussels sprouts until Christmas Eve, tossed them with olive oil and balsamic vinegar, and served them for our big dinner with Meave’s family. And it was then that I really appreciated them. It’s all about the eating. What else? Sunchokes and our perennial herb patch made their debut this year. We were pretty happy with both of those experiments, in large part because neither of them required much maintenance on our part. This is part of our strategy as we add different perennial crops one by one: We want to add these little bits of value for our members in ways that don’t take too much of our time away from our usual lineup of annual crops. In this regard, the sunchokes are sort of a double-bonus item because they add value as cut flowers and as late-season edible tubers. Speaking of the perennial herb patch: What did you think of the perennial herbs? We’d like to hear some more feedback about them. Did you use them? Did you like them? Do you think we need more of any of them? Is there any other perennial herb that you’d like added to the patch? This was also our first year to host an intern from Delaware Valley University’s Organic Farming Certificate Program. Lyndsey from DelVal joined us several times during the spring and helped us get things set up for the season. Also! We received some much-appreciated volunteer help from Meave and Stacy and Matt and Andrew and my parents and Dan and Judy and Keith and Megan and some folks from the Unitarian Universalist church … and I bet I’m still forgetting some folks. Thank you! And we’d like to thank all of our members. It’s very satisfying to grow real, wholesome foodstuffs for real people that we get to meet and talk to each week. Thanks for supporting us; thanks for appreciating the fruits and vegetables of our labors. You make this job worth all the hard work. Thanks so much to all of you for making this season such a pleasant and productive one!